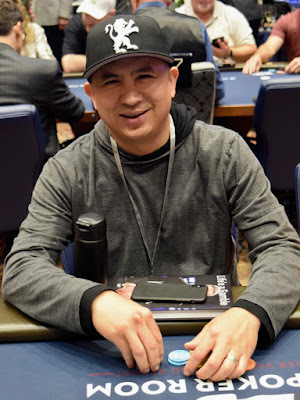 @JCTran23 is the latest of yesterday's Grand Opening Celebrity Bounties to join the Day 1A field in the $500,000 Guarantee @WPTDeepStacks Main Event. JC joins Tyler Patterson and Rep Porter today as bounties playing Day 1A. Wait, no, I don't mean they are bounties TODAY ... I mean they were bounties YESTERDAY .... Charles Rosenblatt, who eliminated JC, won an entry to the Main Event as his bounty prize.